Although John D. Rockefeller Jr. spent most of his life engaged in philanthropy, his single, defining business venture was the creation of the “city within a city”. Constructed during the Great Depression’s worst years, the project gainfully employed over 40,000 people. When Rockefeller Center officially opened in May 1933, it held true to the developing team’s belief that art was an act of good citizenship. 30 Rockefeller Plaza boasted a grand lobby decorated by accomplished European artists, Frank Brangwyn and José Maria Sert. During its first decade, the complex bustled with exciting tenants like the French bookstore, Librairie de France and the brand new publication News-Week (as it was originally called). And with a western edge devoted to entertainment, Rockefeller Center has some real bragging rights — it was the site where John Hay Whitney and David O. Selznick decided to produce Gone With the Wind and where the ever-adored Christmas Spectacular debuted. “Don’t ‘give the people what they want,’” said S.L. “Roxy” Rothafel, the man who created Radio City Music Hall. “Give ’em something better.” Throughout the 1930s, Rockefeller Center steadily improved, including some accidental innovations like the Christmas Tree tradition in 1931 and the skating rink in 1936. By 1939, more than 125,000 people were visiting Rockefeller Center daily; on its own, it would have been the 51st largest city in the U.S. The tumultuous decade remembered for World War II, the Great Depression’s conclusion, the commercialization of the television, the Jitterbug and the “zoot” suit also marked the completion of all of Rockefeller Center’s 14 on-site buildings. Word certainly spread fast — by the beginning of the forties over 90% of the property was already fully occupied with eager renters. Also Rockefeller Center was now established as a community social hub. 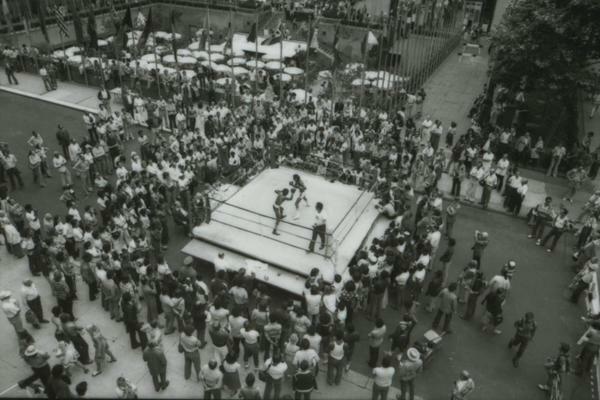 New Yorkers constantly congregated in the Channel Gardens, situated between the British Empire Building and La Maison Francaise, as something new was always happening. In 1941 Rockefeller Center transformed its promenade overnight, transplanting crab-apple trees in full fruit and over 2000 red, bronze and yellow chrysanthemum blooms in celebration of their autumn festival. On Navy Day in 1945, over 8,000 people visited the Observation Roof to view the return of the fleet on the Hudson River. 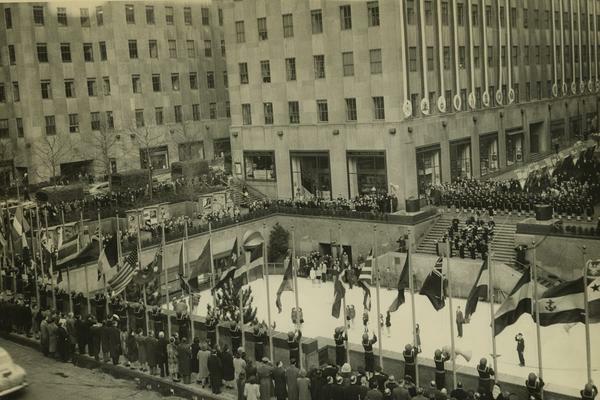 Rockefeller Center was also a destination for dog shows, holiday gatherings, art exhibitions and other anticipated social events. The 1950’s spike in television and movie culture was greatly reflected in Rockefeller Center’s progression. 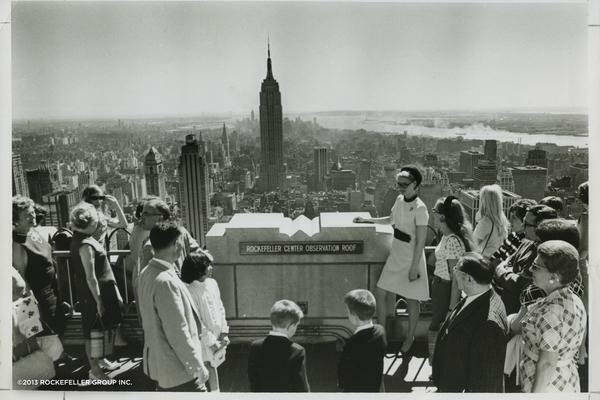 Between the debut Today Show broadcast from 30 Rock, a “Sidewalk Superintendents’ Club” (a group who gathered in a designated space to watch Rockefeller Center’s construction development) dedication by Marilyn Monroe and more, the entertainment facet of Rockefeller Center was definitely making a name for itself. 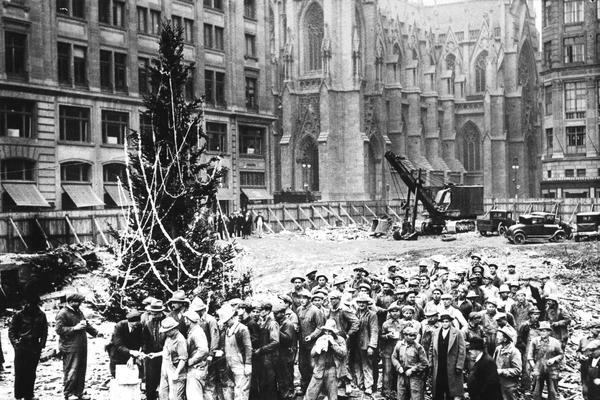 The decade also brought more attention to the beloved Rockefeller Center Christmas Tree. The Tree made its first television appearance on The Howdy Doody Show and Christmas Tree decorations were growing more and more elaborate yearly. In 1950, red garland and white plastic globes created the effect of strung cranberries and popcorn. 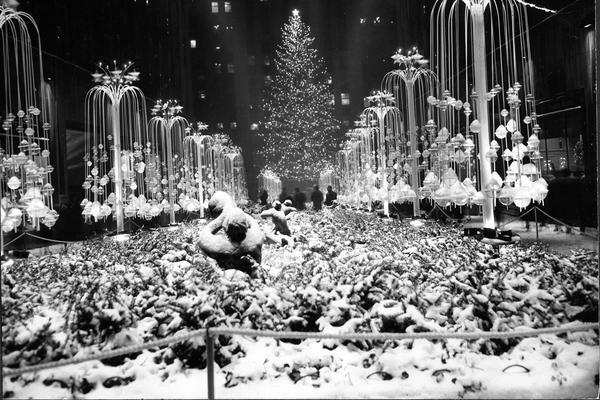 In 1953, 6,000 shimmering icicle lights and giant red floodlights illuminated the tree. Then in 1954, wiry, white angel trumpeters were the latest addition to herald the holidays. Although the decade began with the death of Rockefeller Center founder John D. Rockefeller Jr., his legendary philanthropic ways endured. With the rise of the Cold War, Rockefeller Center initiated a shelter program, stocking their basements with supplies. Also, after the 1963 Christmas Tree had spent three weeks on holiday display, its 60 feet of Norway wood was donated to a Boy Scout troop. Rockefeller’s dreams of entertainment continued to proliferate throughout the sixties as Radio City set show attendance and long run records for Bye, Bye Birdie and The Odd Couple respectively. 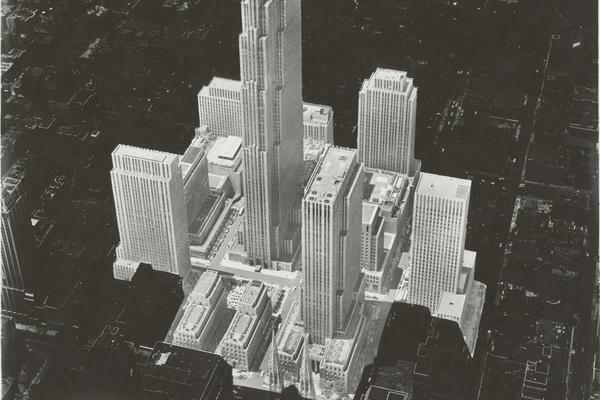 And as wait lists to rent at Rockefeller Center rapidly grew, developers decided to expand the complex west to Sixth Avenue, landmarking even more of midtown Manhattan. Starting with a New York City real estate slump that left Rockefeller Center with more vacancies than ever before, the seventies brought along some tough times for Manhattan’s premier “city within a city.” Even the celebrated Radio City Music Hall experienced serious setbacks as superfly seventies culture shifted the music and entertainment tastes of many. However Rockefeller Center’s sluggish decade was uplifted when the glamorous art-deco complex, composed of symmetrical layouts and decorative patterns made of elegant geometric shapes, was finally presented with the prestigious recognition it deserved. The American Institute of Architects declared Rockefeller Center the second most significant piece of architecture in America, placing only after Thomas Jefferson’s University of Virginia. After some shakeups in the seventies, Rockefeller Center made a comeback with the prosperous economy of the 1980s. And although it was the eighties, 20 seemed to be the recurring number of the decade: in 1986 the Christmas Tree sparkled with a record 20,000 lights and in 1987, the Rainbow Room reopened followed a $20 million renovation, featuring a new menu with 20 different varieties of bottled water. The 1980’s also marked Rockefeller Center’s foray into the Stock Exchange, offering the public the opportunity to become investors. The beginning of the 1990s came in like a lamb for Rockefeller Center. 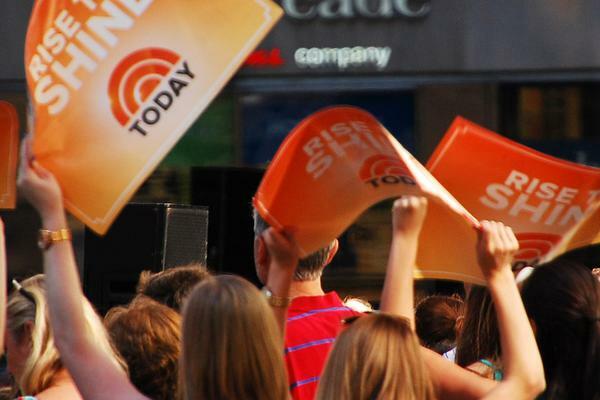 Frank Sinatra sold out five straight shows at Radio City Music Hall, The Rainbow Room poured over 200,000 glasses of champagne and The Today Show began its fan-favorite outdoor broadcast from its street-level studio. But by the mid-nineties, times got tougher and a new real estate slump moved Rockefeller Center into Chapter 11 bankruptcy. Luckily, less than two years later, a new group acquired the complex, leaving the 1995 bump in the road history. Goldman Sachs, Tishman Speyer and David Rockefeller acquired controlling ownership of Rockefeller Center, making way for a future of exciting enhancements. Recognizing that an estimated million people walk through Rockefeller Center every year, current co-owners continue to strive to revive John D. Rockefeller’s original visions for the complex as much as possible. Jerry I. Speyer, Chairman and CEO, proved to follow through when he said that his company wanted to make it possible for “New Yorkers and visitors to appreciate and experience major pieces of art in a public forum.” Now Rockefeller Center’s annual art unveiling is a highly anticipated New York City tradition. From great 20th century sculptor, Louise Bourgeouis’ bronze Spiders spectacle, to Agnes Winter’s Monument to Smile exhibition, to Takashi Murakami’s Reverse Double Helix display, the 2000s have been filled with innovative and inspirational masterpieces. Also kept alive is Rockefeller’s humanitarian spirit. In 2008, a “penny harvest” collected over 100 million pennies to be donated to community grants and service projects throughout the city. And in effort to contribute to a healthier environment, the complex has installed 363 solar panels and is planning a green roof on top of Radio City Music Hall. 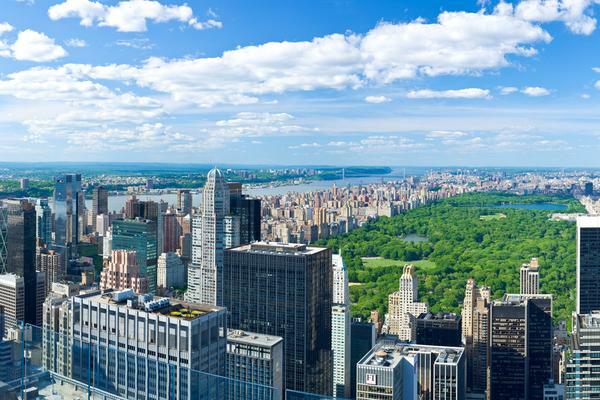 With even more exciting experiences, including the reopening of the Top of the Rock Observation Deck, and the addition of the Swarovski Star on top of the iconic Christmas tree, the first decade of the 2000s was nothing short of amazing. But the best is yet to come. Leveraging the momentum of the 2000s, Rockefeller Center kicked off the second decade of the new millennium with the introduction of the first-ever solar-powered Christmas tree. Using energy-efficient LED lights, the tree conserved power and shined brighter than ever. But that’s not all. New public art installations—like the Jeff Koons’ Split Rocker—brought spectacular works of art to the attention of thousands. The Rainbow Room reopened and the new Bar SixtyFive introduced NYC to its highest terrace bar. U2 jammed out on the Top of the Rock. SNL celebrated its 40th anniversary. 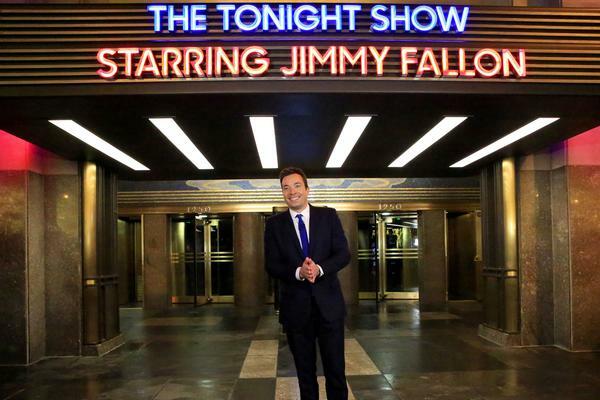 The Tonight Show returned to New York after 42 years away. And in 2017, the biggest night in Broadway—the Tony Awards—officially returned home to Radio City Music Hall. With all this, it’s safe to say 2020 will close out yet another impressive decade for Rockefeller Center. And this is just the beginning.